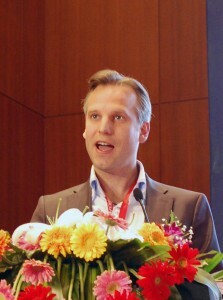 Dimitri de Boer, Vice Chairman of China Carbon Forum, gave a presentation March 30 on ‘Global Trends in Renewable Energy’ for the opening ceremony at the 5th China New Energy International Forum, which was hosted by the China New Energy Chamber of Commerce (CNECC). The forum this year, which was held at the China National Convention Center, was based on the theme ‘New Energy – the Burgeoning Industry of Strategic Importance,’ and included over 500 participants, with several high-level players in the renewable energy industry in attendance. The speech, ‘Global Trends in Renewable Energy,’ provided insight into what role renewable energy will play in solving the impending shortage of the world’s oil supply, as well as the problem of rising greenhouse gas emissions. It was noted that wind, solar, and offshore wind were particularly promising new energy sources, with China leading the world in the installation and development of wind technology and solar hot water renewable energy sources. Along with these global trends, political factors – such as the 2008 financial crisis, and the Japanese nuclear disaster – were mentioned as key issues affecting the development of the world renewable energy market. 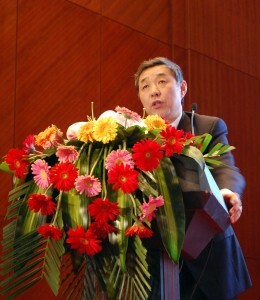 Li Hejun, Chairman, CNECC; CEO, Hanergy Holding Group Co., Ltd. In addition to the main forum, seven professional sub-forums—solar PV, solar thermal, wind energy, biomass energy, new energy and financial capital, crystal silicon solar cells, and thin-film solar cells – were also held at the conference to encourage deeper discussion of key new energy areas.